If we proved anything in this series, it’s that crime is everywhere in healthcare. That means it’s all of our problem. So what now? What do you do to prevent crime from happening, and what do you do when you find out a crime has been committed? We’ve got three major guidelines that you can take away from all the stories where the worst among us are giving the rest of us a bad name. As we’ve said so many times through this series, the following statement seems obvious, but we still have to say it. No one should have to tell you to serve your customers in a way that values their humanity and dignity. But it’s not just the obvious violations - like stealing from the elderly or threatening to poison someone based on their race or religion - that violates the trust your customers have put in you. What about billing patients incorrectly? Maybe it’s an honest mistake. Maybe it’s fraud. Either way, it's the responsibility of the healthcare provider to get out in front of any story. Not to control the narrative, but to apologize. There’s no reason to believe that the person who revealed patients’ HIV status through the mail had any malicious intent. But it happened. There’s no reason to think that UConn or anyone else who’s been hacked recently asked for their data breaches. But those happened. What’s crucial in the wake of these breaches of patient trust is transparency and quick action. Admitting that you have a problem is the first step, after all. Because it's not anybody's responsibility but your own. The temptation to rely on the government - or anybody else - to set the guidelines is totally normal. As cyber attacks like those above continue and even increase in frequency, we could rely on the government to set security standards. But in these and so many other matters, we can’t wait for the government to make a ruling. Partially because the government makes its fair share of mistakes, too. You know how many Medicare payments can go wrong in a single year? $23 Billion worth. And look at what we found out about the VA hiring doctors with questionable histories, a phenomenon that has unfortunately been discovered in Native American healthcare, as well. Don’t limit this to the government. You shouldn’t be waiting for anybody to make your supply chain as ethical as possible. If you're not going to take the necessary steps, who will? Are you worried about the lack of security in medical devices coming through your facilities? Help draft an informed policy that sets your company’s standards. Are you concerned that your suppliers are providing you products manufactured through forced labor? Investigate technologies and strategies that could help eliminate modern slavery. Are you just trying to make sure the substandard practices you’ve witnessed don’t get you in trouble? Don’t get caught. Okay, that last one isn’t exactly a winning strategy. Not just because it’s a criminal mindset. But because, even if it takes years, the bad apples are found out. And there are consequences. That’s it. It’s that simple. Which is to say: it’s not simple at all. Unless you think being good is easy. In which case, please give some pointers to the rest of us. 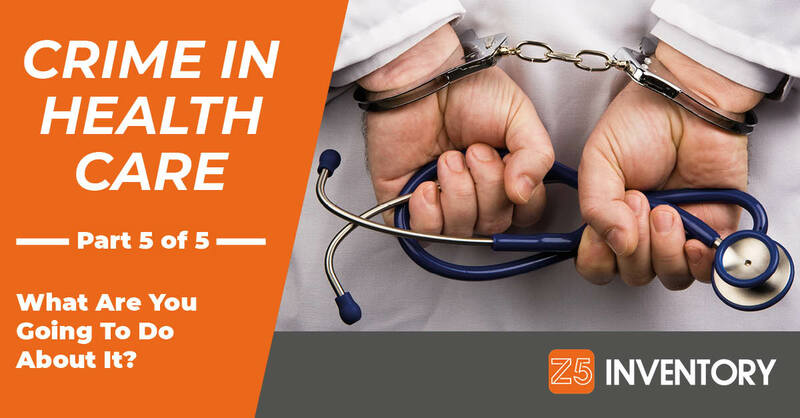 This is Part Five in Z5 Inventory’s five-part “Crime In Healthcare” series. To see all the published entries, click here. Cover photo by Depositphotos and Z5.